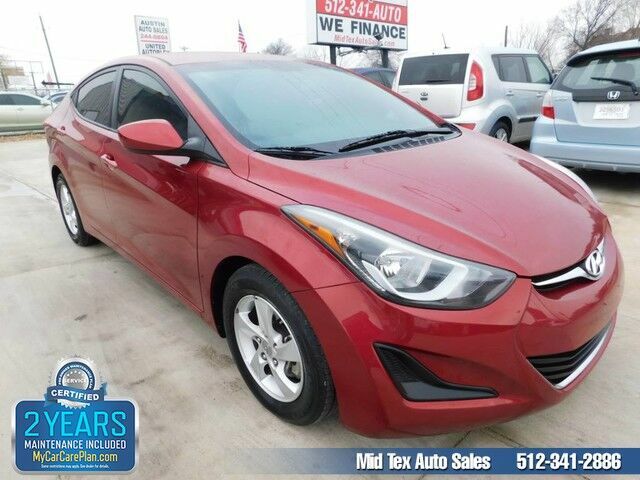 This 2015 Hyundai Elantra SE is offered to you for sale by Mid Tex Auto Sales. This vehicle is loaded with great features, plus it comes with the CARFAX BuyBack Guarantee. The look is unmistakably Hyundai, the smooth contours and cutting-edge technology of this Hyundai Elantra SE will definitely turn heads. Just what you've been looking for. With quality in mind, this vehicle is the perfect addition to take home. More information about the 2015 Hyundai Elantra: The Elantra is Hyundai's entry into the compact car market, battling against household names such as the Honda Civic and the Toyota Corolla, as well as hatchbacks like the Ford Focus and Mazda3. It is a competitive segment, but the Elantra stands out with its bold styling, roomy 5-door GT, high level of equipment and outstanding warranty. Starting at $17,250, the Elantra has plenty of standard features and even manages to top 38 mpg on the highway with its 1.8L engine, while a 2.0L offers a big boost in power while sacrificing little in the way of economy. Interesting features of this model are excellent warranty, available in a variety of body styles, Economical, well-equipped, with sophisticated infotainment features and options, and practical Visit Mid Tex Auto Sales online at www.midtexautosales.com to see more pictures of this vehicle or call us at 512-341-2886 today to schedule your test drive.